For over 230 years, the Birkenstock family has been perfecting their tradition of shoes designed to follow your foot’s every contour and deliver exactly the amount of support it needs. 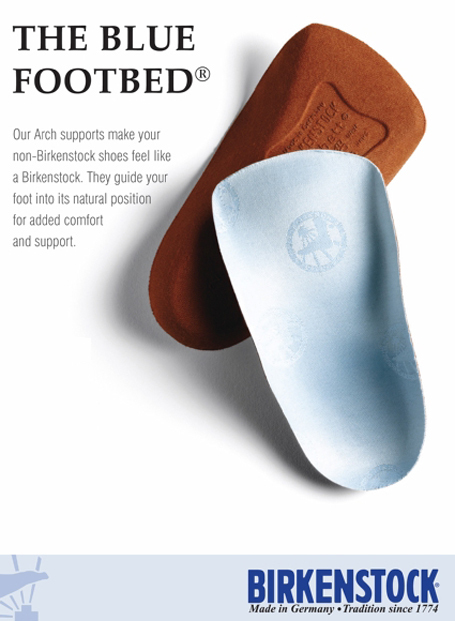 The classic Birkenstock footbed features pronounced arch support, but customers in need of more aggressive support can take advantage of high-arch styles, while those requiring only moderate support will love Birkenstock’s soft footbed styles. All Birkenstocks are designed with deep heel cups for proper foot alignment and weight distribution, and spacious toe boxes so your toes never feel cramped. Konrad Birkenstock invented his company’s trademark contoured footbed in Germany in 1897. Birkenstock fans can thank Margot Fraser, the founder of Birkenstock USA, for bringing these now-beloved shoes to the United States over forty years ago. After she tried on a pair at a German resort and was very impressed by their quality and comfort, she created Birkenstock USA and began importing the shoes to the US. Beginning in small amounts, she soon had to import more and more styles as thousands of Americans became satisfied customers.